Laptop cooling pad, one of the essential accessories for a laptop geek. There are a lot of cooling pads available in computer markets and Gadget geeks have ease to buy online products of laps. So why you need a laptop cooler pad? So if you are one them who works for a long time then you must have it. 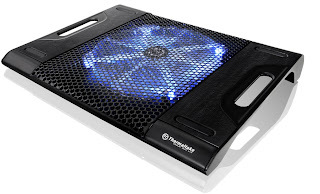 Cooling pad reduce heat exhaled by FAN and keep temperature at low as possible. Using cooling pad, you can increase life of your laptop. Mesh surface with 1 powerful Fan and can be used for laptops and MAC PCs.